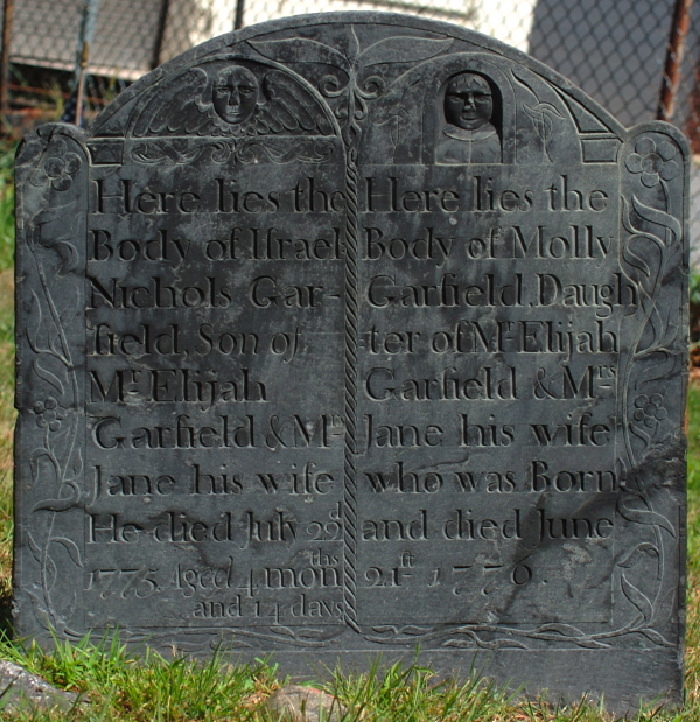 In the burying ground in Lexington, MA, there is a stone dedicated to the six children of Abijah and Sarah Childs who died in August and September of 1778. The Childs family had a seventh child who either survived or was not born until after the epidemic. The stone does not specify the children's cause of death, but it was probably an infectious disease such as smallpox or dysentery. These illnesses were rampant in Massachusetts in the 1770s, due in part to the poor sanitation and cramped quarters in army camps. In the summer of 1778, an outbreak of smallpox in nearby Cambridge forced the cancellation of commencement ceremonies at Harvard and inspired frightened citizens to build a new smallpox hospital near Fresh Pond. I can't say for sure that smallpox killed these children, but it isn't a bad guess. Other bloggers have commented on this stone and on the epidemics that swept the Boston area during the 1770s. I don't have much to add — I haven't been able to identify the disease that killed these children and their story is tragic, but not unique. I just wanted to call attention to the individual portraits of the children, which are beautifully detailed. These are almost certainly from the William Park workshop in Groton. You're welcome to post that image to you blog (or not) -- I just stuck it up there as a temporary file and may delete it after a while. If you use it, just link back to my South Street page as the source.